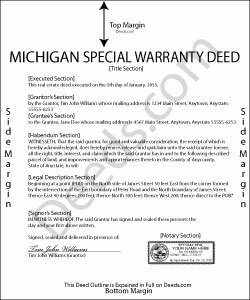 Special or limited warranty deeds, or at least the forms for such deeds, are not able to be used in Michigan, according to MCL 750.275: "Any person who shall print, sell or keep for sale any blank forms of deeds containing the words 'warranty deed' or 'warranty-deed covenant-own-acts,' or any similar words printed or written thereon, unless such deed is in fact an absolute warranty deed, and any person who shall knowingly use any such deed for the purpose of conveying title unless the same is an absolute warranty shall be guilty of a misdemeanor." Instead, a covenant deed (sometimes called a Deed C) can be used in the place of a special warranty deed. In a covenant deed, the grantor's warranty is limited to claims arising from the actions of the grantor. A covenant deed should be dated, duly signed by the grantor, and acknowledged. A deed executed in Michigan can be acknowledged before any judge, clerk of a court of record, or notary public within the state. The officer taking the acknowledgment should endorse a certificate of acknowledgment on the deed (565.8). A covenant deed executed out of state and according to the laws of such state can be acknowledged before a judge of a court of record, notary public, justice of the peace, or other officer authorized by that state to take acknowledgments and can then be recorded in Michigan (565.9). A conveyance of real estate that is not recorded will be void as against any subsequent purchaser in good faith and for a valuable consideration, of the same real estate or any portion thereof, whose conveyance is first duly recorded. If the first recorded conveyance is in the form of or contains the terms of a quitclaim deed and release, this does not affect the question of good faith of the subsequent purchaser, or be of itself notice to him or her of any unrecorded conveyance of the same real estate or portion thereof (565.29). Real estate deeds should be recorded in the county where the property is located. Nellouise S. said: Documents are ok but I needed to reword some of the verbiage and it cannot be edited without paying a monthly or annual membership. otherwise it is a very nice site. Michael O. said: Received everything that was promised.